I love cute Valentine mailboxes and last year I fell in love with the idea of having them for the kids to leave sweet notes and treats to each other leading up to Valentine's Day. 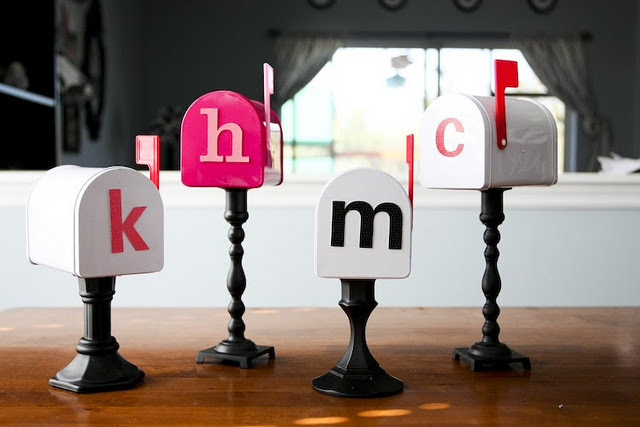 Emily seemed to stumble upon the same idea online and made these super cute pedestal Valentine mailboxes for her kids. You can check out her DIY Valentine mailboxes over at The Anderson Crew. The mailboxes are only a dollar at Target right now! My father is in a nursing home and doing activities helps him to manage his pain. He has been working on birdhouses but I think I will head to Target and get him a few of these to decorate. Since the staff thinks he is such a cutie and a charmer, perhaps they will fill them up with Valentine's Day cards! Thanks so much for the inspiration! Oooh, I hope these are at my Target! Could be the beginning of such cute traditions for the kids! Kathe, that would be so neat!! I hope they're at my Target too! That's adorable.